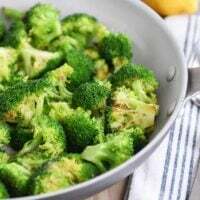 This easy skillet broccoli side dish is super tasty and takes less than 10 minutes to make proving that a good side dish should be simple and totally stress-free. Can we talk side dishes for half a second? I know seeing a recipe for “skillet broccoli” pop up in front of your online face may not be the most exciting thing in the world, and trust me, I wish I was actually staring at a decadent ooey gooey chocolate chip cookie recipe, too, but side dishes aren’t all bad. Weeknight dinners are really straightforward. A main dish (very possibly leftovers at least once a week). And one (maybe two-ish) side dishes. And I use the term “side dishes” very loosely. Many nights we’re talking things like: cottage cheese, sliced cheese, cut up fresh fruit, fresh veggies with ranch, applesauce, crackers, etc. I am all about simple, simple, simple side dishes. Believe it or not, as much as I love to cook, there aren’t any angels singing hallelujahs at my house during the dinner hour. It’s usually kind of chaotic and rushed even with the best planning efforts in force, and I don’t have any extra energy to fuss around with elaborate side dishes (I’d much rather save that energy for dessert – ha!). The one thing I’m kind of particular about is having a couple vegetables present at dinner – either embedded in the meal (like Shepherd’s Pie or Chicken Pot Pie or vegetables in a soup like this minestrone) but mostly as a substantial side dish. I feel like it is good for kids’ souls (and adults too) to come face-to-face with vegetables on a regular basis. Some variation of these roasted vegetables easily happens multiple times a week, and thrown together green salads, no recipe required, are also a popular veggie side dish. Another quick side dish we love and turn to often are these skillet green beans. Because I’m often giving side dish suggestions to you guys (have you ever noticed the “what to serve with this” section right before the recipe for main dishes?? ), I wanted a placeholder for an equally yummy, but more importantly, equally tasty skillet broccoli recipe. …and then you can choose how to dress it up! I’ve given three flavor variations below – each very delicious. Parmesan. Lemon. Sesame. So, yeah, while this may not be the most exciting recipe in the world, I’m hard pressed to minimize the excitement when I’ve literally been guilty of snitching almost the whole pan of this delectable broccoli before it even hits the table. Also, BIG HINT, this cooking method works great for cauliflower and asparagus, too. Heat the oil in a 12-inch nonstick skillet over medium-high heat until the oil is rippling and hot. 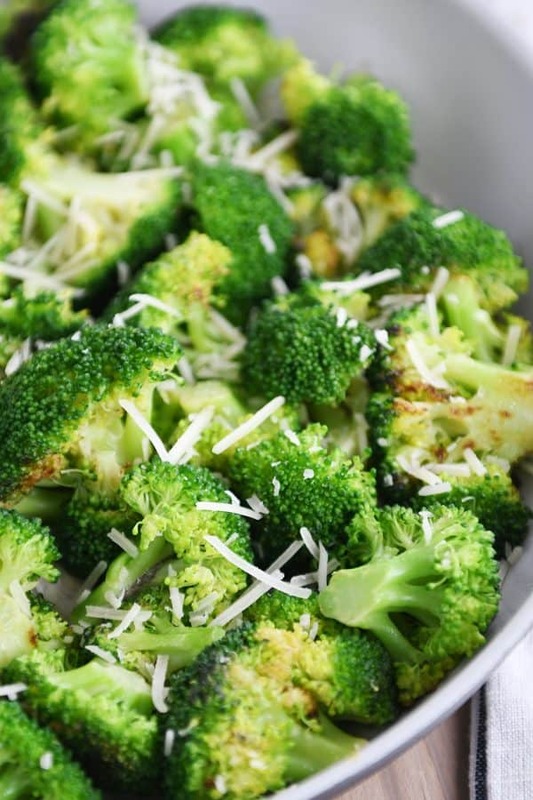 Add the broccoli in a mostly single layer and sprinkle with a pinch of salt. Let the broccoli "roast" in the hot skillet for 30 seconds or so and then give it a good stir. You can let it keep browning for a minute for more flavor or move on to the next step. Pour in the broth, immediately cover the skillet with a lid (or foil), and reduce the heat to medium-low. Let the broccoli simmer for 2-3 minutes until bright green and crisp-tender. Add additional time if you want the broccoli more tender. Remove from the heat, add seasonings to taste (additional salt or variations below), and serve. This recipe can easily be halved in the same size or smaller skillet. Just make sure you have a lid to fit (or use foil in a pinch!). You can also use water in place of the broth; there won't be quite as much flavor so taste and add salt, if needed. I haven't tried this with frozen broccoli. 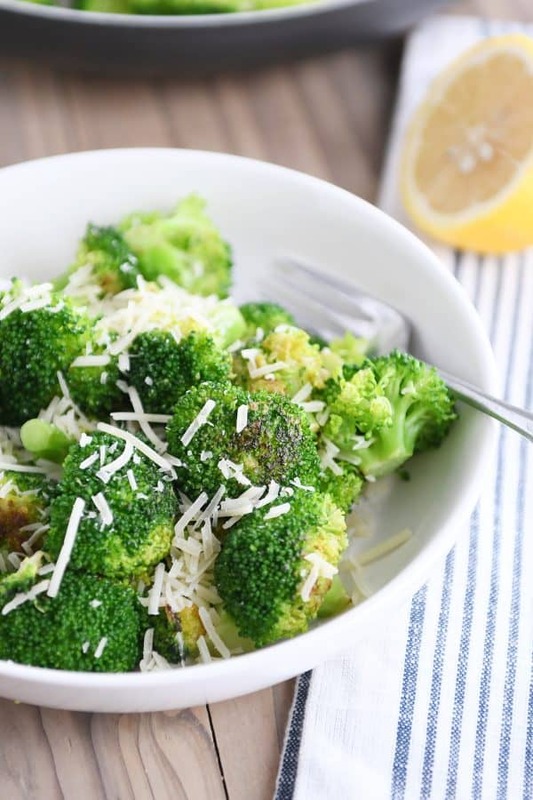 VARIATIONS: 1) Parmesan (sprinkle shredded Parmesan cheese on top after the lid comes off the broccoli before serving), 2) Lemon (squeeze the juice of 1/2 lemon over the top of the cooked broccoli and grate a bit of lemon zest over as well), 3) Asian-vibe (drizzle 1 tablespoon sesame oil over the cooked broccoli and sprinkle with toasted sesame seeds). Super easy, fast and delicious – another winner. Thanks! Mel you’re a miracle worker! You actually made my 9yo boy eat broccoli and enjoy it!! I did this for dinner tonight and it’s so yummy, I may just make it for lunch tomorrow too! Thank you for this. I don’t feel like I have a lot of time for preparing side dishes, so having something this easy and delicious in my back pocket has really helped me out! Our family’s favorite veggie side! Also great to add left over chicken, pasta and parmesan. So good! While I usually roast my broccoli, I decided to try this out. Delicious and easy to make! My 12-year old actually liked broccoli, thank you Mel! Can I use this in a casserole? I make chicken broccoli casserole. And my broccoli on the bottom is just a little ehhh. It needs help. CBC is steamed broccoli under a layer of chicken in cream of chicken mayo lemon juice and Parmasan cheese…… but I am sure you know this classic recipe. This was DELISH!!!! I used about 8 cups of broccoli; I didn’t have chicken broth so used 1/2 cup water and through in a chicken bouillon cube, then I didn’t add any extra salt. Was amazing, thanks again Mel! I made this super simple and fast dish the other night. Wow! So good and so easy! We had the parmesan version. This is so helpful to have another quick side dish recipe as a go-to, since we get in such a rut with the same ‘0l veggies. Thank you for sharing!! So easy, so good! We did the Asian variation. I snuck several from the pan before dinner even started. My 4-year-old had 3 helpings before we finally told her she had to eat some of the other food on her plate (Mel’s teriyaki meatballs…also super yum and a repeat meal here). And then she still asked for and ate some more. It was a hit with the whole fam (half of whom prefer roasted veggies, half who prefer steamed…it was kind of the best of both worlds). Haha, glad I’m not the only one guilty of snitching some before dinner even starts! And wow, props to your 4-year old! We made the parmasen version last night and my hubs declared it the best way to have broccoli! It was a hit with all of us, thanks! Oh and I meant to also say that I love your what to serve with this section! It’s so helpful!! *Excellent* side dish. So fast, easy, and healthy. I couldn’t believe how quickly I could get it ready — quicker than making a salad. Thank you, Mel! Simple and easy to make it. 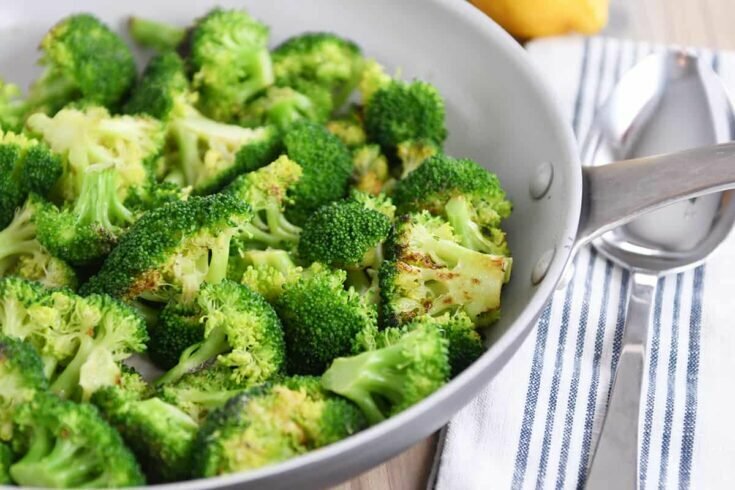 Have some broccoli, will try it for tomorrow breakfast. Thanks for sharing! I am the slightly crazy woman who hugged you in Costco last week! It was so fun to see you in ‘real’ life! This website has become such a trusted resource for me and I feel like we are friends! So thank you for what you are doing here. PS thanks for the broccoli recipe! We are all big broccoli fans at my house. Haha, I loved the hug, Leah! Thanks for saying hi. 🙂 And thanks for such a sweet comment! I’m always checking your side dish suggestions! Two of our favorites are the skillet asparagus and skillet green beans. My girls love broccoli so I’m excited to try this as well. I love simple recipes with fresh ingredients. Thanks for posting this one (actually, three)! This may sound strange but I could eat broccoli morning, noon & night. I absolutely love it. Definitely my favorite vegetable. I will try this & report back! I made this tonight and it was good! Broccoli isn’t my favorite but I make it all the time because it’s healthy and cheap. This was so much better than mushy steamed, which is how I always do it. I even forgot to add the lemon juice or other extras, but it was still great. Definitely will make again! Glad you liked it, Katie! Thanks! Made this last night, tried all three ways (small portions of each) and all were delicious! I think the Sesame was my favorite. The broccoli was even very tasty with just salt and pepper. I love roasted broccoli, but it takes forever. This is a great alternative! Thanks, Mel! Loved broccoli this way! Such a fast, healthy side! Mel I look forward to using this recipe. I do something similar with cabbage. Slice in thin slices add to hot pan with olive or avacado. Salt, stir and add a sprinkle of caraway seeds. Serve while hot and tender cooked. Like many others, I find the side dish suggestions are one of the most helpful things about your blog! 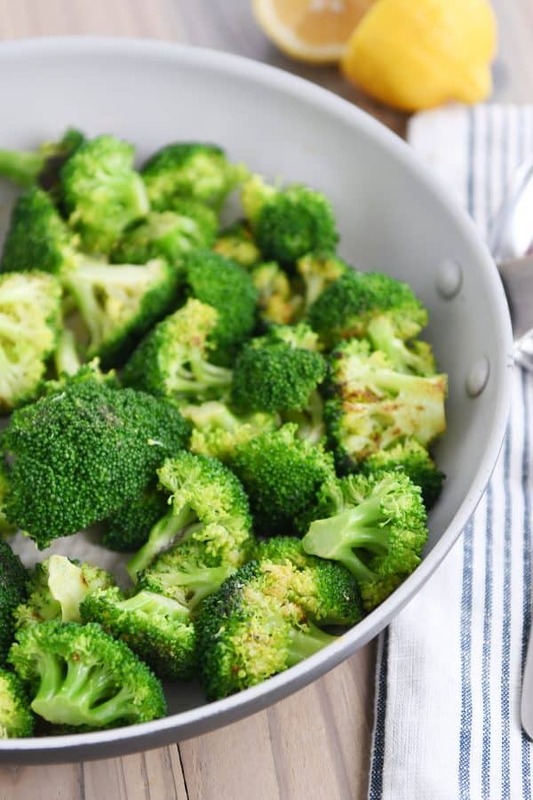 I’ve been making a variation of this recipe but steaming the broccoli in half water half orange juice and grating a little ginger over the top before it steams. I will try it with chicken broth next. Thanks for all your work! I love your side dish recipes too! I always consult the what to serve section, and love it especially when there is a vegetable side there – I feel like that is the hardest part of a meal to plan. I know these recipes don’t always have the most exciting pictures on the front page compared to desserts, but I get sooo much use out of them. For example – I am completely in love with your instant pot spaghetti squash recipe. I usually roast brocolli, and my family likes it that way, but I will have to try this – it sounds a lot faster. Thanks, Thora – it’s helpful to know that the side dish suggestions are being looked at! Glad you love that spaghetti squash – keep it in mind because I have a KILLER spaghetti squash recipe to post in a couple weeks. Best spaghetti squash thing I’ve ever eaten. Yeah I’m always checking out your side dish suggestions and your ultimate side dish planner! I love them! I usually roast the broccoli in the oven, but for warmer days I’ll be making it this way. Thanks! I just made this for lunch and it was AMAZING! It is like a broccoli side dish that I’ve had at a restaurant before. Now I can make it at home. That is what I love about your blog! I love that I can make foods that I find at restaurants, but I can do it at home. Thanks Mel! Thanks, Alyson! So happy you loved it! Thanks Mel for a great simple recipe! I meal plan but only the main dish and so most the time my sides are salad, or frozen corn or beans heated in the microwave. And that gets boring! I have been trying to be more intentional about planning side dishes now and this recipe will help! Thanks!! Your side dish suggestions on each main course recipe is one of my favorite things about your blog! Thanks Mel! Thanks for letting me know that, Ashley! Also, I love love love the “what to serve with this” section. Thank you for helping me get out of my boring vegetable rut. This is strange but as a kid and even now as an adult a small splash of red wine vinegar on my cooked broccoli makes the broccoli divine!! For the bad rap that broccoli that gets, I actually have a kid who LOVES it. Well that’s awesome! It’s amazing how happy it can make me when my kids gobble up veggies. Haha. Quick question…To keep things simpler on busy weeknights, I would prefer to use frozen veggies. It saves me time on the cleaning and cutting! Plus, in my rural grocery store, frozen veggies are often cheaper than fresh. Do you have any suggestions for your veggie sides (broccoli, green beans, roasted veggies) on how to adapt them using frozen veggies? Wasn’t sure if I should thaw and drain them or start with them frozen?? Thanks so much! I haven’t tried this using frozen veggies – I know frozen veggies actually roast pretty darn well in the oven. My sister made roasted broccoli for a get together using frozen broccoli and it was delicious! She didn’t thaw it first – just threw it on a sheet pan with some oil, salt and pepper and roasted it until tender. If you wanted to try this recipe with frozen veggies (I haven’t yet), I wouldn’t thaw them first. Thank you for this. I often struggle with side dishes too and I love your skillet green beans and often make your oven baked brown rice. I will definitely try this. Thanks! Thanks for keeping us well rounded. Even though I have been guilty of eating cookies for breakfast, lunch and dinners on occasion, veggies are important and side dishes make your dinner plate even prettier. This is my favorite way to make brussels sprouts, and I forgot that we like broccoli this way as well! Thanks for the reminder! Brussels sprouts are a great idea for this method – thanks for the tip! I feel the same as you do about side dishes. Thanks for this recipe!